I love feeling your little kicks and punches inside of me. It's so sweet now...when it doesn't hurt or wake me up or break my ribs. Weirdly, it took finding out your gender for me to become really excited...or for this to feel really 'real.' It is real, and I can't wait to have you here, even if you ruin everything in the best way. How Far Along: 20.5 weeks. I should start doing these earlier in the week, probably. Gender: Girl girl girl girl girl girl girllll. Did you hear we're having a baby girl? For the record, the first things that were said after she told us were (in this order). "Dammit, your dad was right?" Because we knew he's be smug about it (he was). And "Thank GOD! We couldn't come up with a boy's name anyways!!" Movement: Yeppers. I can feel kicks now and then. Occasionally she flips around and it feels like snakes are loose my stomach, but not terribly often. Oh look...she just kicked. How I'm Changing: My belly is seriously growing DAILY now, after it didn't feel like it had yet. Total Weight Gain/Loss: I haven't stepped on the scale since my last midwives appointment and don't plan on it until my next. 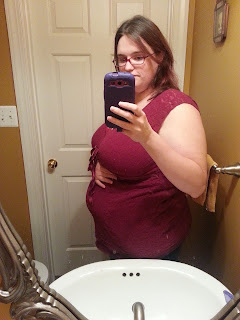 Maternity Clothes: my friend gave me some more, but most of it is nursing shirts. I really need to invest in some more pants. Even my sweats are going to start getting snug soon. How I'm Feeling: Exhausted. I need to start taking iron. I don't find it acceptable to be tired 90% of the time that I'm awake. I'm also really grouchy/hormonal/bitchy/crying. Last night I had a bit of a meltdown and cried hysterically after Newton scratched me. Yeah, I'm pregnant but the crying crap can stop already. Sleep: I wake up around 3am to use the bathroom. I try laying on my side, but it feels like my stomach is going to fall off. It's just weird. I generally sleep on my left side or end up on my back, b/c it doesn't hurt then. I'm not sleeping enough. Ideally, I'd sleep from 10-11pm-9am. Lately, (last night) was more like 12am-7:30, and I was exhausted for it. I can't take naps. I don't really get why 8 hours of sleep leaves me feeling like 4 hours of sleep did before I got pregnant. What I miss: Energy, not crying. What I'm Eating: Lately I've really wanted soup. I made some beef stew the other night and that was lovely. I also love apples. Best Moment this week: As utterly overwhelming as it was, I've been having fun working on your gift registry. I'm so happy we know that you're a little girl, and that we have a name, and so many people around us supporting us.